Exotic python and flashy hardware come together to create a bag so beautiful you'll base your outfit around it. Black/silver/brown python with brown calfskin trim. Top handles with wrap detail and double rings; 8" drop. Removable shoulder strap with lobster clips; 34"L.
Zip top with two pull-tabs. Inside, one open, zip, and cell pocket. 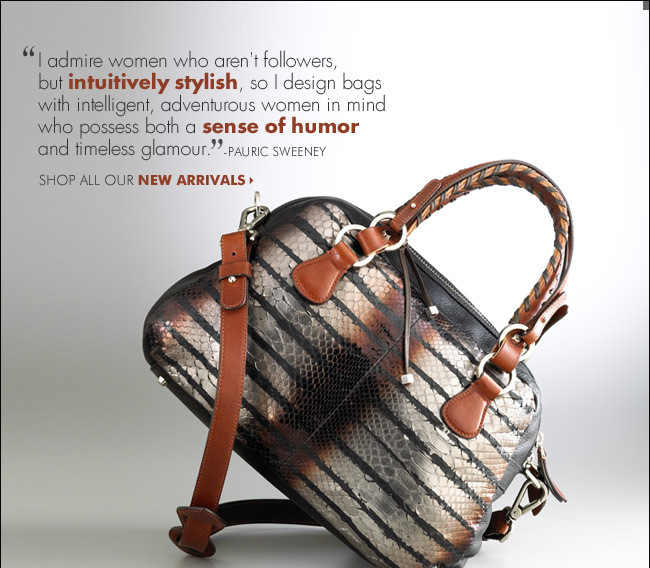 9 1/2"H x 15"W x 6"D.
The above handbag by Pauric Sweeney is Style # NMS10_V0JXS at Neiman Marcus. Learn more about Pauric Sweeney.